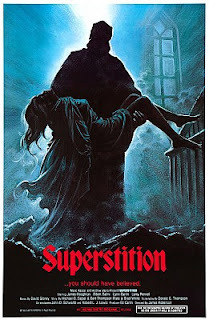 I don't think they meant for Superstition to be a comedy, but I found myself laughing constantly throughout it. Overall, I thought this move was terrible but that doesn't mean it wasn't entertaining. This one is definitely over-rated on IMDB but here's what I enjoyed about the film. First of all, it has some really great sight gags. This isn't your typical 80's slice and dice. They tried to be creative with the kills which have more in common with a Road Runner cartoon than they do Friday the 13th. The biggest missed opportunity was a "death by paper cutter" that almost happened. Alas, it was not meant to be! They settled for a hanging instead. The witch who seeks her revenge in Superstition is also mildly entertaining. We see her full figure only in flashbacks some 300 years ago when she was put to death by drowning. In the present time we only her her cackle and her super strong arm that grabs most of her victims by the head an tosses them around like a kitten with a mouse. Again, this is very Road Runner and elicited a number of laughs from yours truly. The rest of the film is bad acting from Canadians whose names we've never heard of, plus a plot that is pretty predictable from start to finish. I'd skip this one if I were you. There are lots of great slasher flicks from this era that you could watch instead. Look elsewhere on my blog for suggestions. That's all folks!